This southern style chicken and rice casserole is the most savory dish around! With just a few classic ingredients, this casserole will take you only minutes to combine and its ready to pop in the oven. Topped with a buttery and mouthwatering crust, this one is perfect for any get together or potluck! Ya’ll, the southern girl is coming out in me…so get ready for this one! And it’s not because I started off my sentence with the word “ya’ll”! 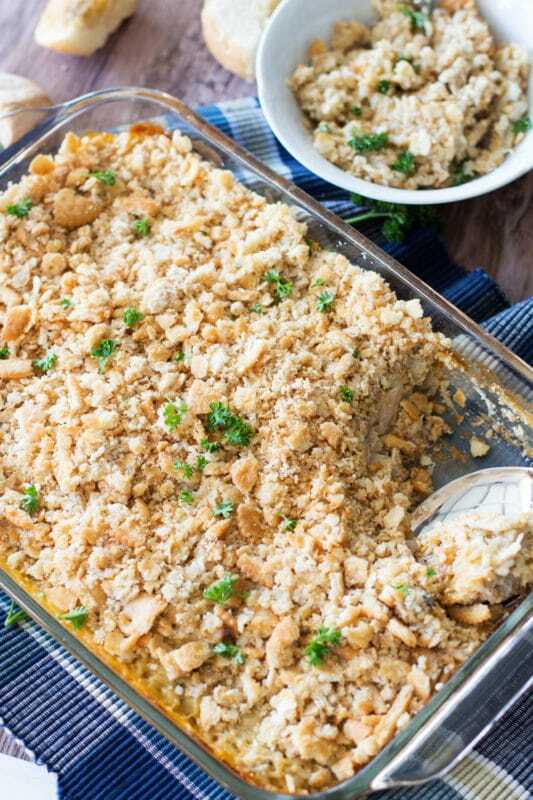 This homemade southern style chicken and rice casserole SCREAMS southern comfort food! And let me tell you…it’s beyond delicious! This Chicken and Rice Casserole recipe is special to me because Brenda was my mom’s best friend. Brenda was always so caring toward me and she was just a fantastic lady! Brenda would always bring this dish to our church potlucks and when I was 16 I personally asked her for the recipe and she gave it to me. And I’ve kept it all these years! And now I’m sharing it with all of you because it’s THAT good and it needs to be shared! It’s absolutely a recipe worth repeating and passing down! I still don’t think you understand…people get 3 and 4 servings of this casserole. It’s THAT good! They will be filling their plates and bowls up left and right! Good thing this casserole feeds 10-12 people!! Brenda passed away about 15 years ago. She will always hold a special place in my heart and every time I make this chicken and rice casserole recipe, I think of her. I make this recipe a lot….I take it to family and friend get togethers and to company potlucks. I also take it to people who aren’t feeling well or who just had surgery so their families can have a warm, comforting dinner. Yes, it’s that special! So, how in the world do you make Chicken and Rice Casserole? 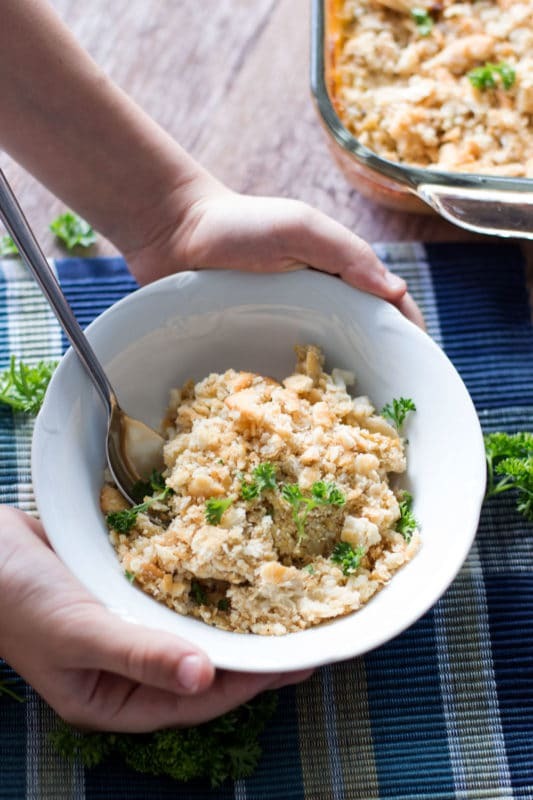 I’m glad you asked because there are so many different ways to make a Chicken and Rice Casserole but this is hands down the absolute best recipe out there. 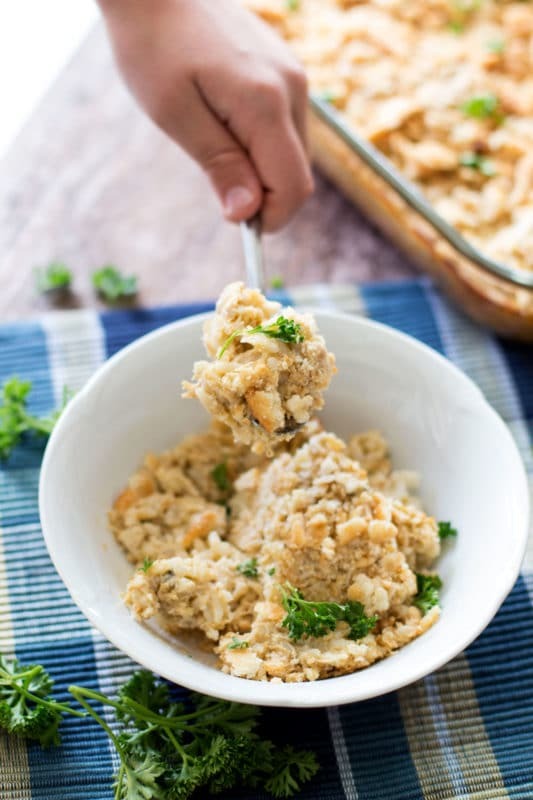 This Chicken and Rice Casserole is made with soup (both Cream of Chicken, Cream of Mushroom and Chicken broth) and it’s super easy to make! It has a wonderful crust made from Ritz Crackers, butter and chopped onion. And, this Chicken and Rice Casserole can be prepared ahead and frozen to be eaten at a later time. Yeah for FROZEN MEALS! Oh, and since we are talking frozen meals…you can make my Lasagna into a frozen meal, too. Check that one out for sure! We need to talk gluten free for a minute. This Chicken and Rice Casserole is not gluten free. I know…believe me, I KNOW! But I’ve tried to make a gluten free version and it was just…well, not good at all. I’ve tried making 3 different gluten free versions of this casserole and I just can’t get it to taste good! So – here’s my challenge to you. If you can figure out HOW to make this a gluten free Chicken and Rice Casserole that tastes amazing, let me know and I’ll send you a prize! Because I’m the master of making traditional recipes into amazing gluten free ones and ya’ll, I can’t figure it out with this one. Although the name of this recipe really should be something like “Southern Style Chicken Casserole”, I really wanted Brenda to be associated to this one because this one is from her. It’s unique and it’s comforting…and that was Brenda. So that’s why I decided to call it “Brenda Rowland’s Chicken and Rice Casserole”. For 20 years, that’s what I’ve called it and the name just sticks! Anyone who eats this Chicken and Rice Casserole falls in love with it and I know that statement will hold true for you too! So make sure to share this one with your friends and family! 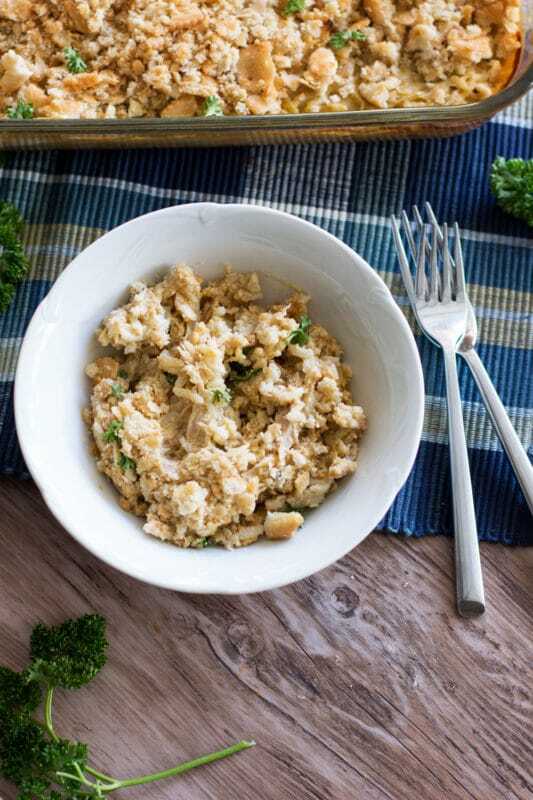 This hearty chicken and rice casserole is the most savory dish around! With just a few classic ingredients, this casserole will take you only minutes to combine and its ready to pop in the oven. Topped with a buttery and mouthwatering crust, this one is perfect for any get together or potluck! Cook the raw chicken breasts in a pot of boiling water until cooked all the way through. When cooking the chicken, you want to make sure you include the fresh quartered onions, garlic, salt and pepper. That will help season the chicken while it cooks. While the chicken is cooking, bring a separate pot of water to a boil and cook the "Boil in Bag" rice according to box directions. When rice is done cooking, drain and set aside. Once the chicken is done cooking, drain the water and let the chicken cool. Throw away the onion and garlic that was cooked in the chicken. When the chicken has cooled, shred the chicken by hand and place in a large mixing bowl. Combine all ingredients in the recipe, excluding the finely chopped onion, Ritz Crackers and butter, into the big bowl of chicken and stir together. Place chicken and rice mixture in a 9x13 pyrex dish. Bake on 350 for an hour, covered with aluminum foil. When the casserole is done remove from the oven and set aside. Take the finely chopped onion and sauté in butter in a small saucepan. While the onions are sautéing, crumble up the up Ritz Crackers by hand and place in a separate bowl. Once the onions and butter are sautéed, pour the onion and butter mixture into the bowl containing the Ritz Crackers and mix well. Remove the aluminum foil on the casserole and pour the cracker mixture on top of the casserole and broil in the oven on high until crackers are lightly toasted. Let casserole cool for 15 minutes and then serve. NOTE: If you want to make it SUPER easy on yourself, skip boiling the chicken and buy an already cooked Rotisserie Chicken! Just pull it off the bone and you're ready to mix it with all the other ingredients! Easy Peasy! 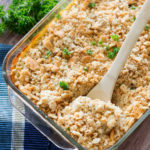 Make sure you share this amazingly hearty Chicken and Rice Casserole to your favorite Casserole and Dinner Boards on PINTEREST! 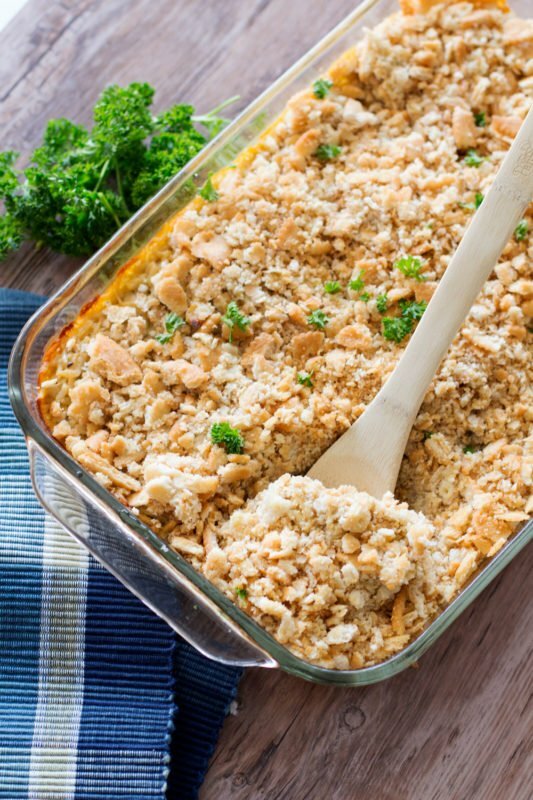 What a simple and delicious looking casserole this is Amanda! I will definitely be making this dish in the near future. Well done! Oh, thanks Matt!! I hope you enjoy it! 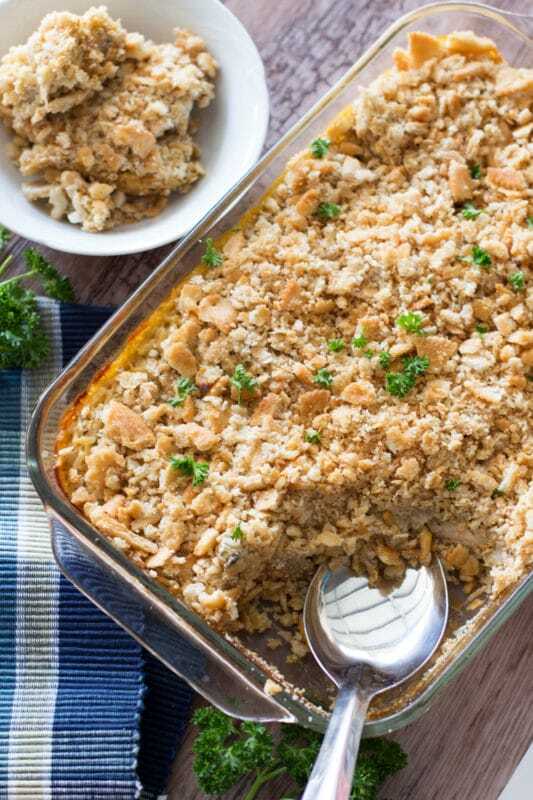 I love the backstory behind this casserole and the special connection to your mom’s friend. It looks so good and I love that crumbled topping! Thanks! yeah – it has sentimental value but MAN is it delish!! Try it…it’s so good! I will do that now! Thanks for the comment! !